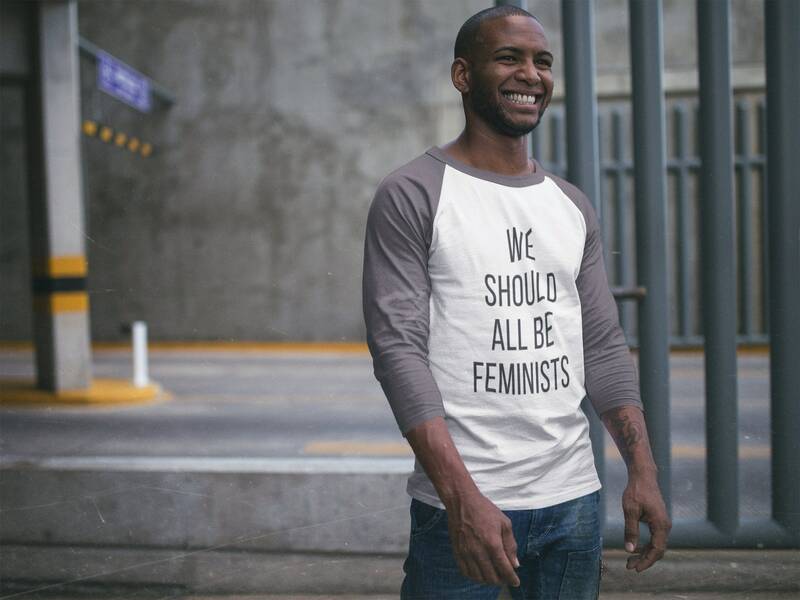 Our feminist shirts are so much more than a statement. 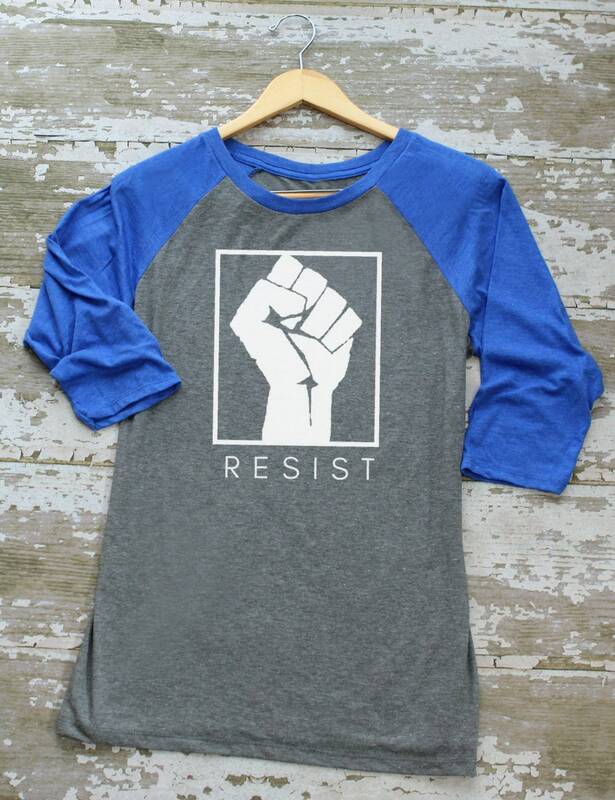 They're your super-soft armor as you resist, persist, and change the world. We're women owned, women inspired--5% of purchases go to Women Int'l. Please note! These sizes are UNISEX. 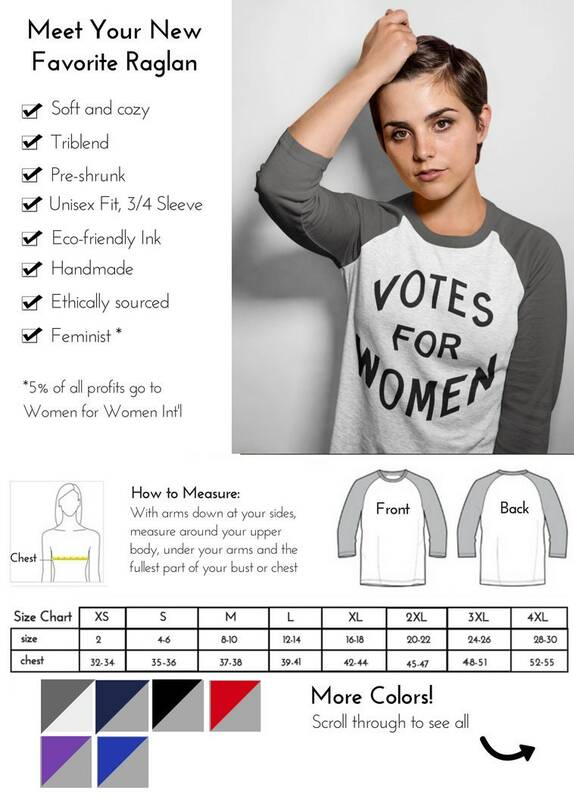 Etsy labels all unisex sizing as "men's" (because patriarchy.) Generally, you'll want to choose your typical size. But if you're a woman and want a more fitted look, you may want to size down one! 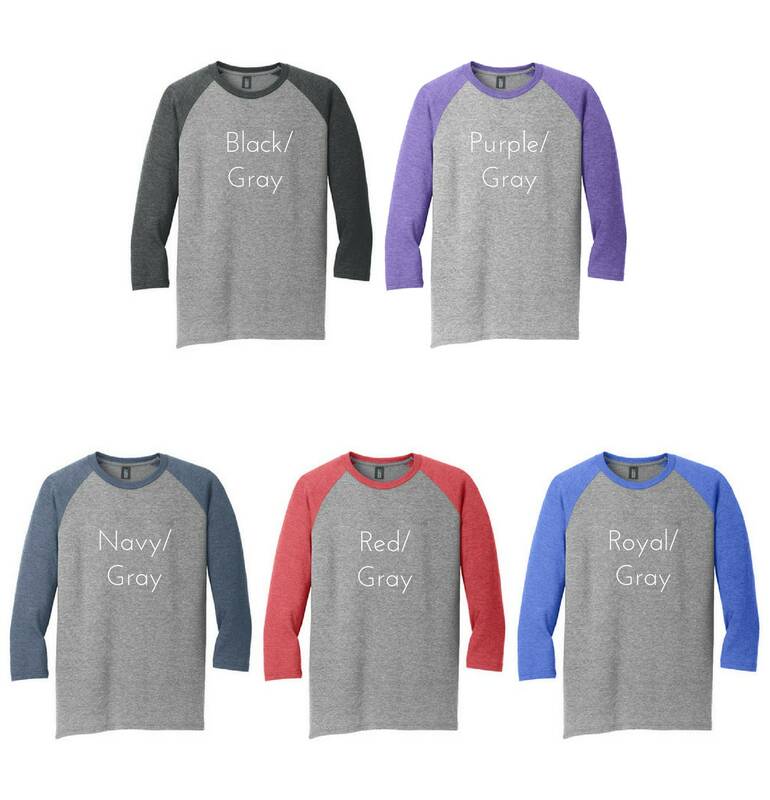 This UNISEX raglan shirt is the definition of classic fashion, created with nothing but comfort in mind. ¾ sleeves. Materials: Preshrunk 50/25/25 poly/ring spun combed cotton/rayon. No toxic chemicals here! We use water-based, eco-friendly inks to screen print our shirts. Check out our FAQ below for more information on custom order, organizations we donate to, sizing, materials, shipping, and wholesale opportunities. Please note that all Idaho orders are subject to 6 percent tax. Once shipped most domestic orders take anywhere from 2 to 10 business days to arrive depending on the efficiency of your local postal service. International shipping delivery times may vary between 2 and 12 weeks. Items are shipped within two weeks, depending on factors such as order volume (all items are made by hand on demand). We'll get your order out as soon as humanly possible (just keep in mind that when order volumes are high, we are limited in how fast we can get orders out by sleep and our day jobs. Let us know through email (at time of payment) if you have any special considerations. To keep your shipping charges reasonable, we ship via USPS First Class Mail. It is very important to me that you are satisfied with your purchase! If there is any problem with your order, message me right away and we will make it right. If for any reason, you need to return or exchange any items, please contact me within one week of receiving your purchase. All returns and exchanges must be made within 30 days. Please note that all returns must be in unworn, unused condition, and that the buyer is responsible to pay return shipping charges. Please note that the women's shirts sold on Fourth Wave are not your standard babydoll. The relaxed fit triblend runs true to size and is a not a juniors style (read: not clingy), ultra soft, ultra light, preshrunk, and is a flattering, feminine fit on pretty much anybody. Choose your normal size. A sizing guide can be found with the photos of each shirt. Everything you see here is made by hand, by me, with real ink and real screens. I aim for perfection, and I want you to be happy with your shirt. But as a non-Walmart human, every now and then I don't notice that I got a dab of ink on my hand, etc. Please let me know if there's a problem with your shirt. I want you to love it, and I want you to wear it with pride. You should also know I use waterbased inks. I use them because they're nontoxic (and emit water when I cure them instead of deadly chemicals so I don't expire in my studio). I love the way they look with these retro designs. The white ink is NOT 100 percent opaque on all tshirt colors, and will show a little bit of your tshirt color through the ink (scroll through the photos above to see what I mean). If you're looking for a thick, opaque ink (that will crack and peel as it ages), you want a mass-produced shirt from Walmart. Last thing! Please note that all orders are made on-demand (e.g., I don't keep a massive stock of shirts with me at all times). This helps me keep costs as low as possible and give you tons of options in size and style. To fulfil your order, you must provide me with certain information (which you authorized Etsy to provide to me), such as your name, email address, postal address, payment information, and the details of the product that you’re ordering. You may also choose to provide me with additional personal information (for a custom order of a shirt, for example), if you contact me directly. 1-2 week turnaround. Price varies depending on how many shirts you order. Prices include ONE color of ink, and one design location, up to 9 x 12 inches (either horizontal or vertical) in size. Preparing your artwork and creating a screen for your unique design is included in your pricing! 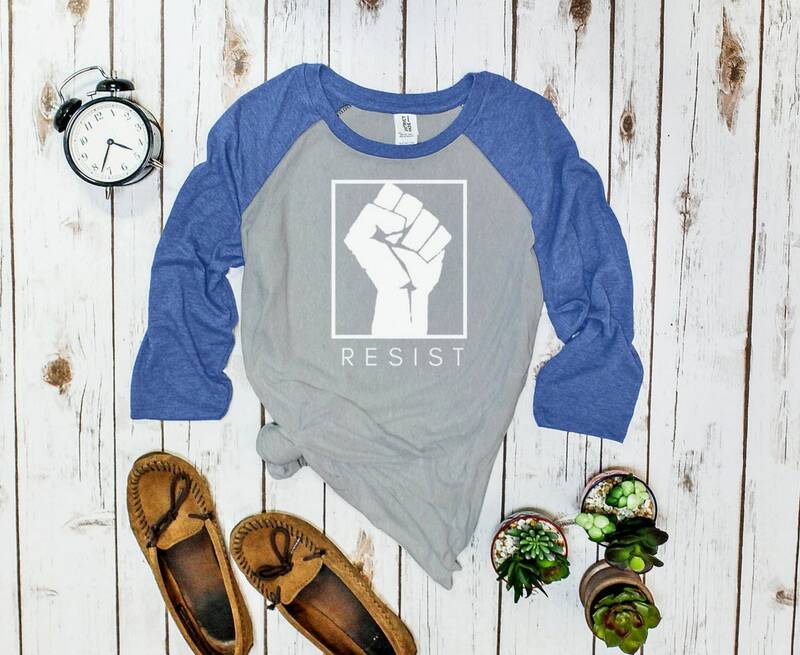 http://fourthwaveapparel.com - Click on "Wholesale"
Wholesale pricing applies even if you order several different styles of shirts (from different listings)! Just shoot me a message. If you'd like me to help you design something, I'm happy to do that, just send me a convo! And if you know what you want, please send me a high-resolution PDF of the design to fourthwaveapparel@gmail.com ! Please note that your design MUST be the same across all t-shirts. Does Fourth Wave donate to any organizations? We also support our local Democratic Party of Idaho! Fourth Wave’s t shirts run very true to size (scroll through the photos above to see real women and men wearing Fourth Wave). 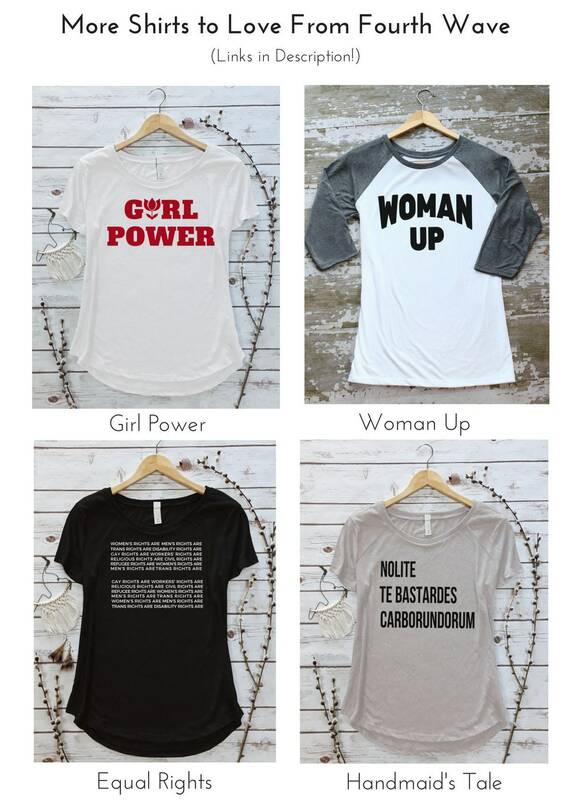 The blank apparel industry is filled with cheap babydoll shirts, and I’m not interested in selling you any of those. Take a look at our sizing chart (just scroll through the photos above), and order the right size for you. I absolutely love the styles I offer here. They’ve been carefully curated for their softness, fit, quality, and style. I’m also proud to offer sizes XS-4XL on almost every item in my shop. Inclusive sizing matters, and all bodies are beautiful. I use high-quality, butter-soft, no-shrink, triple-stitched, true-to-size apparel. I take ethical sourcing and ethical production very seriously. The wholesaler I work with is a member of the Sustainable Apparel Coalition (SAC), which upholds rigorous standards for sustainability, sourcing, and ethical work conditions. As well as the Fair Labor Association (FLA) and the Quality Certification Alliance (QCA). I use eco-friendly, water-based ink that does not emit toxic fumes while curing. It’s so safe you can eat it (YUM). The ink feels soft when dry and literally becomes part of the t-shirt. Please also note: White water-based ink is NOT 100% opaque on all t-shirt colors. This vintage look is 90-95% opaque--and beautiful. Are Fourth Wave's products handmade? Everything you see here is made by hand, by me, with real ink and real screens. 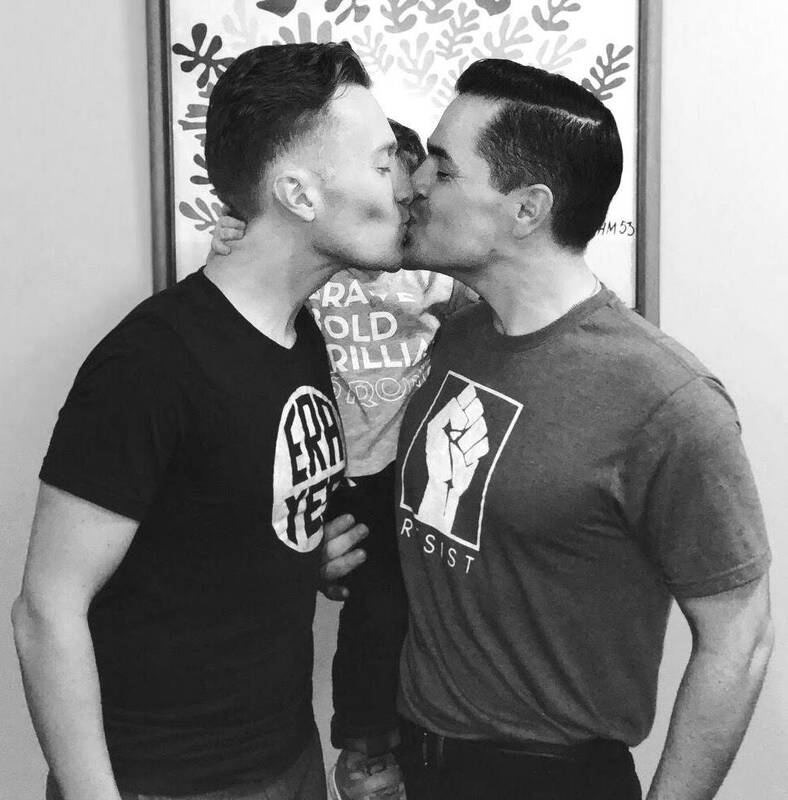 I personally believe in the messages I create, and you’d better believe I’m wearing my own shirts out into the world as I work to make it a better place for all of us. Keep in mind that all orders are made on-demand (I don't keep a massive stock of shirts in all designs/colors/sizes because that would be WHOA). Creating your shirt on demand helps me keep costs as low as possible and gives you lots of options in size, color, design, and style. Where can I find Fourth Wave on social media? 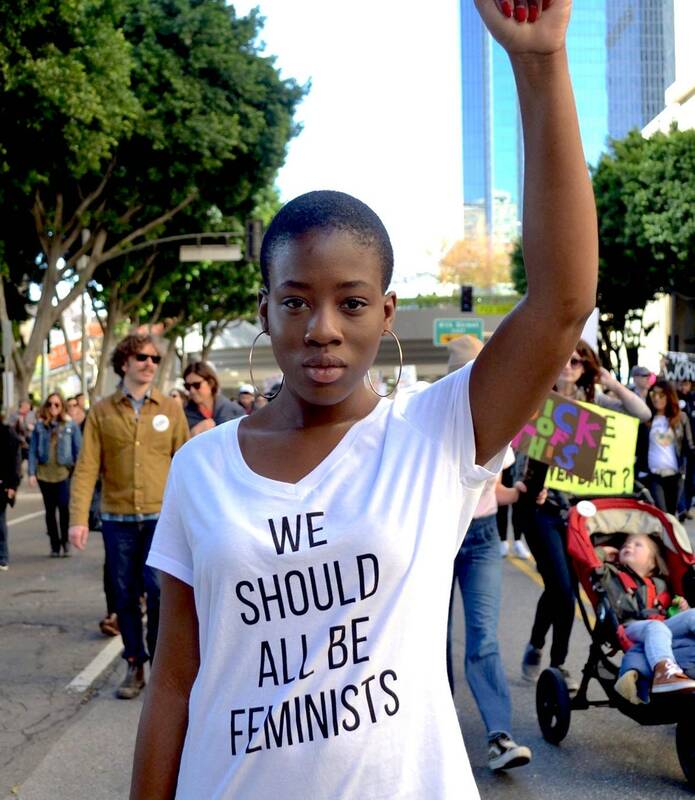 Seeing your photos on Facebook, Instagram, and Pinterest warms my feminist husk of a heart. Whether you're marching, protesting, or having brunch with your BFF, I love to see women and men! 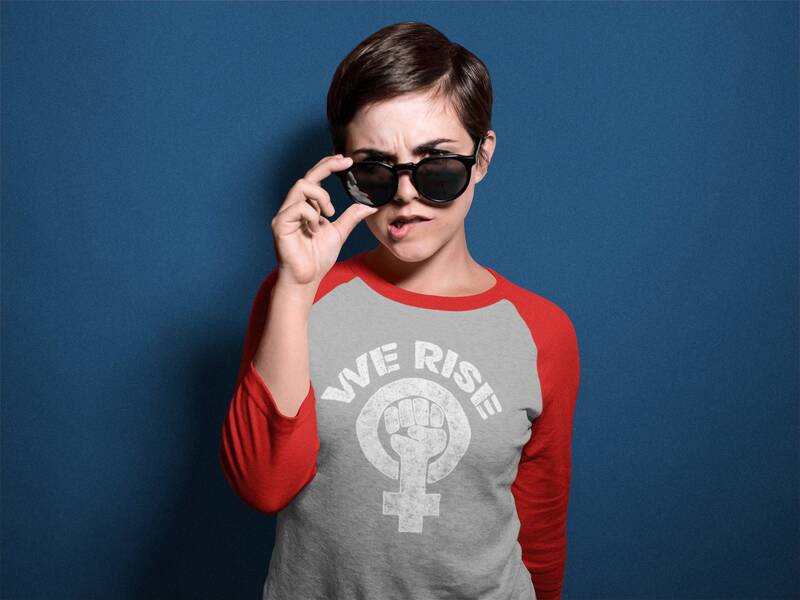 of all shapes, sizes, ages, and colors wearing Fourth Wave feminist apparel. Tag your photo with #FourthWaveApparel find me on Facebook (Fourth Wave Apparel), Instagram (@FourthWaveApparel), and Pinterest (Fourth Wave)! Etsy calculates shipping automatically, based on item weight and size. However, if you are ordering a large number of t-shirts, there will often be a shipping overage, which I'll refund to you as soon as your shirts ship! If you don't see the style/design combo you want, never fear! I make all of my products in house, so the sky’s the limit. I don’t list all design options for every single shirt, so you don't have to scroll for 8 years, but if you love a particular style of shirt but want a different design, just let me know in your order notes. If you’re interested in placing an order of 20+ shirts, please reach out! I’m happy to answer all your questions and can provide quick turnaround and a fantastic, quality shirt for your event or party. I want this to be your new favorite t shirt. That means, if you’re not happy with it, please reach out before leaving me a nastygram in your review. I’m not perfect--despite my best efforts, a little blob of ink escapes without my notice. But I’m always happy to make it right. 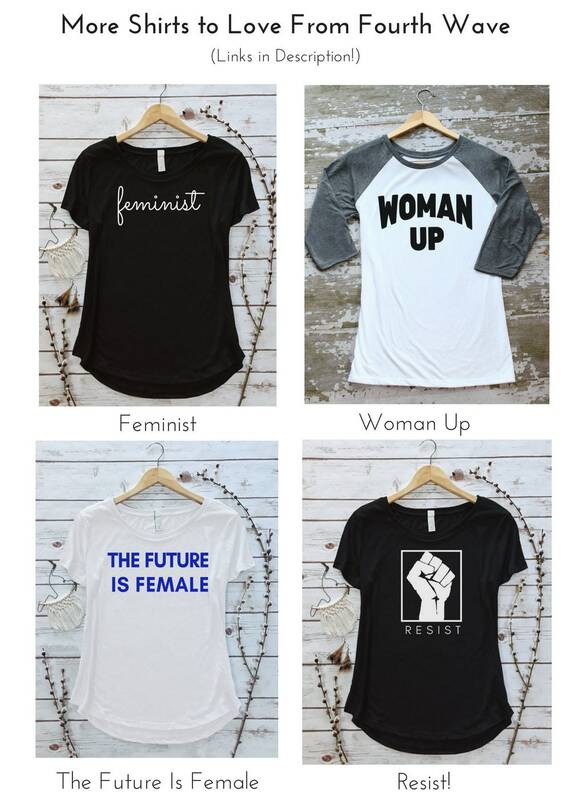 On a similar note, if you LOVE your shirt, please do leave me a review--it means the world to me to know that you are wearing your feminist shirt with pride while you make positive change in the world.